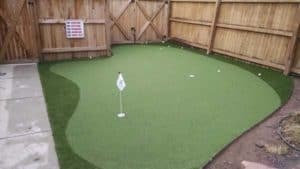 If you are like many of our customers that love the game of golf and want to improve their putting game, then one of the best ways to do it is by putting an artificial turf putting green in your backyard. What better way to do it than to step outside into your backyard and start putting within minutes. The more you practice the better are the chances that you will cut strokes off of your handicap. In a relatively short period of time, you will see an improvement in your game, one that your golf partners will envy. 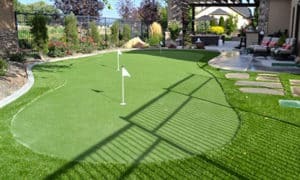 Unlike the natural grass you have in your backyard, our artificial putting greens do not require mowing, pulling out weeds, adding chemical treatments nor do you need to irrigate. Occasionally you will need to use your leaf blower to remove any leaves or other particles that may fall onto your artificial turf putting green. Sure you can have a hot tub in your backyard, even a horseshoe game but it’s nothing like having your own putting green to practice on or have your friends over to entertain. You will definitely be the envy of your neighborhood… at least for those that play golf. The robust green color of our artificial turf does not fade or change through the seasons and the years. This way you can count on having a beautiful putting green to enjoy whenever you want to. What better way than after a long day of work to get your family to come out and play on the putting green in your backyard. Turn off the TV, put away your mobile devices and spend some quality time and conversation with your family. 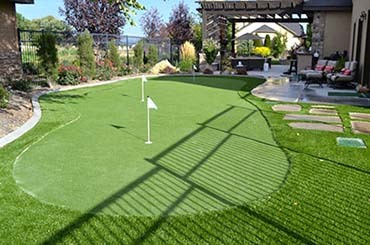 Have a putting green in your backyard can increase the value of your home. It is unique because most other homes for sale don’t have one, and for the person that truly enjoys golf would find this to be a plus to purchase your home. This is a great excuse to have a party at your home, by inviting your friends or business associates over for a friendly game of golf. There are so many different things that you can do with this, such as: competition matches, fundraisers and short game tournaments. And, what better way to watch a pro golf game and then go outside and have a little friendly putting competition! Lastly, what a great way to relieve the stress from the day or week… whenever you want. Perfect turf offers a variety of different synthetic turfs, and has one specifically for artificial turf putting greens. To get more information and to schedule a free quote for your backyard please contact us at (303) 829 – 3374 or click here to fill out a form. Serving Denver, Castle Pines, Parker, Castle Rock, Highlands Ranch, Lone Tree, Littleton, Douglas County, Colorado and more.